Taking care of yourself and the environment never looked better. Enhance your beauty and bathing experience with products that will help you look great while showing respect for the planet. Extend your reach in the shower with these natural loofah bath and body brushes. 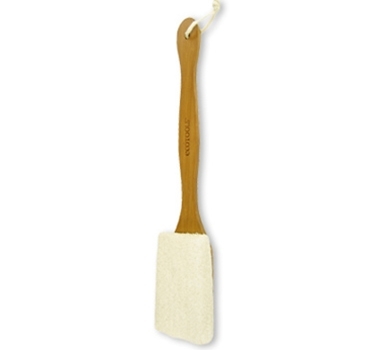 A sleek, bamboo handle holds a large natural loofah to exfoliate and cleanse skin. The shower sponge is condensed to save energy during shipment but expands when wet. The handle has a rope attached for convenient hanging during daily use. Made with natural, sustainable materials. Loofah is condensed for shipping, but expands when wet. Includes a convenient rope for hanging. 3.8" x 2.8" x 21.2"
Wet brush and apply favorite soap or body wash to scrub hard-to-reach areas. Rinse loofah and hang to air dry.